Up to 93% of performance horses suffer from gastric ulcers. Is yours one of them? Here’s how to manage the condition. It’s not a secret that many performance horses suffer from gastric ulcers. In fact, said Frank M. Andrews, DVM, MS, Dipl. ACVIM, equine gastric ulcer syndrome (EGUS) is present in up to 93% of performance horses. What’s worse, this condition is a real problem for training, nutrition, and overall health. Thus, successfully managing EGUS is key to ensuring horses can perform at their best. Recently, Andrews, LVMA Equine Committee professor and director of the Equine Health Studies Program at Louisiana State University’s School of Veterinary Medicine, reviewed advances in treating and managing gastric ulcers in performance horses during the University of Maryland’s Department of Agriculture and Natural Resources’ 2016 Mid-Atlantic Nutrition Conference, held March 23-24, in Hunt Valley, Maryland. London’s Europe-bound troop is counting down the days to a monumental trek to mark the centenary of the end of the First World War. Ten riders, five crew members and three weeks to go — London’s Europe-bound troop is counting down the days to a monumental trek to mark the centenary of the end of the First World War. The local group is joining at least 50 other riders from across the globe Sept. 14 to trace the path Allied forces took when pushing the Germans back from Cambrai, France to Mons, Belgium during the final 100 days of one of the deadliest conflicts in human history. The riders will cover the same distance in only 10. Scientists unveil a 40,000-year-old foal found in Siberia's "Mouth of Hell." A crater in Russia known as the "Mouth of Hell" has regurgitated a highly unusual find: a perfectly preserved baby horse whose kin roamed Siberia around 30,000 to 40,000 years ago. The state of the tiny horse is remarkable. You can even see the individual hairs on its body. The Siberian Times first reported on the foal's discovery earlier this month and covered the detailed unveiling of the body this week. Semyon Grigoryev, head of the Mammoth Museum in Yakutsk, estimates the horse was just two months old when it died. However, I’m still going to take as many photos of awe inspiring areas as I can. My job is to try to inspire horse and mule owners to escape the arena and take the trail less traveled. 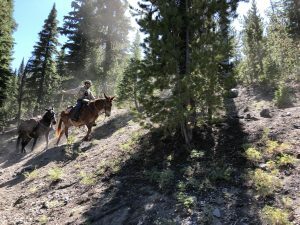 A glorious photo can help get more people out onto the trails and into horse camps, much better than any words that I could write. The Encyclopaedia of Equestrian Exploration, hardcover, in three volumes, by CuChullaine O’Reilly. Published by the Long Riders’ Guild Press. Reviewed by Neil Clarkson. CuChullaine O’Reilly is proof that great feats of equestrian endurance are not limited to the saddle. His three-volume Encyclopaedia of Equestrian Exploration is a literary tour de force and an important contribution to the collective wisdom of equestrianism. We should never forget that much of the world was first explored on foot and on horseback. Frontiers were tamed thanks to our partnership with the horse. Our relationship with these remarkable animals has been recorded through the millennia. They are depicted in ancient cave drawings and described in some of our earliest texts. It is a rich and varied history. Six hundred retailers in 17 countries have already registered to participate in the ninth Riders4Helmets International Helmet Awareness Day, to be held August 18th and 19th. With two weeks to go before the event, Riders4Helmets is on track to exceed the 680 retailers in 19 countries that participated in 2017, with 20% more retailers having already registered than by the same time last year. Riders4Helmets.com has teamed up with 22 helmet manufacturers this year, that will offer discounts on their helmets for two days only, via their global retailer network. The helmet brands that have committed involvement are Champion, Charles Owen, Dublin, EQ3 by Back On Track Canada, Eurohunter, Gatehouse, GPA, International Riding Helmets (IRH), Jin Stirrup, JPC, Kask, KEP Italia, Kwesta, LAS helmets (Leslie Sutcliffe UK), One K, Ovation, Samshield America, Tipperary, Trauma Void, Troxel, Uvex and Zilco. Retailers in Australia, Canada, Denmark, England, Ireland, Italy, Netherlands, New Zealand, Poland, Scotland, South Africa, Spain, USA, and Zambia have already registered to participate in this year’s event. Retailers around the globe who wish to register to participate in the event may register free of charge at this link and will then be added to the participating retailer map. Only retailers who register with riders4helmets will be eligible for restocking discounts from the participating helmet brands (please note – participating brands vary by country). You must register with riders4helmets and not with the helmet brands. Further information for retailers and rules with regards to participating can be found at this link. Equestrians may visit this link to learn more about International Helmet Awareness Day and can search for participating retailers by “Name” or “Geographic Location”. Equestrians are encouraged to visit the site on August 18th and 19th, 2018, to view the most current update, as participating retailers will continue to be added on a daily basis. Learn how to craft a diet for the horse with painful lesions in his stomach. Armed escorts, roadside shootings, searing temperatures, chaotic traffic and mind-blowing bureaucracy. Despite it all, Filipe Leite completed a two-year 10,000-mile journey on horseback from Canada to Brazil. He chronicles his journey in his new book, Long Ride Home. The founder of the Long Riders’ Guild, CuChullaine O’Reilly, talks to Filipe about his remarkable journey, and the many challenges the Long Rider describes in his new book, which even included the need to befriend drug lords to get through. You contacted the Long Riders’ Guild is 2011 in search of advice on how to make an equestrian journey from Canada to Brazil. You subsequently completed a 10,000-mile ride that lasted two years and took you and your horses through 10 countries. Can you explain how a childhood story sparked your desire to become a Long Rider? Lexington, KY (July 31, 2018) - The weekend of August 18th and 19th, 2018 marks the ninth annual Riders4Helmets International Helmet Awareness Day — a campaign event designed to educate people about the importance of wearing a hat, following dressage Olympian Courtney King-Dye’s accident from which she suffered a brain injury. • If you have a hard impact blow while wearing your hat, immediately replace it with a new hat. There may be damage to the hat that is not visible to the naked eye. • Hat manufacturers generally recommend replacing your hat every four to five years. Hats take a beating over time from sweat, heat, dust and rain, and the Styrofoam in the hat relinquishes its ability to protect the head over time. “So, replacing your hat sooner than four to five years may in some circumstance be necessary,” says Lyndsey. • A ponytail or different hairstyle can affect the fit of your hat. When you try on hats prior to purchase, wear your hair in the style that you expect to wear it when riding. • If you purchase your hat online, check the date of manufacture. Purchasing a used hat can be very risky and is NOT recommended. The hat may have sustained previous damage that you aren’t able to see. • There is no statistical correlation between skill level and injury likelihood. Professional riders are just as at risk to sustain injury due to a fall as less frequent riders. • Even a fall from a standing horse can be catastrophic. Your injury risk depends on the height from which fall, as well as the speed at which you’re traveling. • Head injuries are cumulative. An original head injury can be made much worse by additional concussions. • Riding is considered more dangerous than downhill skiing and motorcycling. • Approximately 20% of accidents which result in head injury happen while the person is on the ground. • It is best if you invest in your own hat regardless of whether or not you own a horse. “It is a personal purchase. Your hat is designed to fit your head,” says Lyndsey. An incorrectly fitting hat offers very little, to no protection. In addition to wearing a correctly fitting hat, you must have the harness correctly fastened on your hat. If the harness is not fitting snugly, the hat can rotate should you have a fall and it won’t be able to protect your head to its fullest intention. To celebrate International Helmet Awareness Day, Riders4helmets has teamed up with leading manufacturers to offer special discounts on safety headgear around the globe, via their retailer networks.